When your parents toil thanklessly so that you can go to some fancy art school (OK, I went to a state-funded university), the least you can do is use your degree as an excuse to make them a nice gift now and then. So, when my folks celebrated their 50th wedding anniversary, I decided to cook up something special to commemorate the occasion. 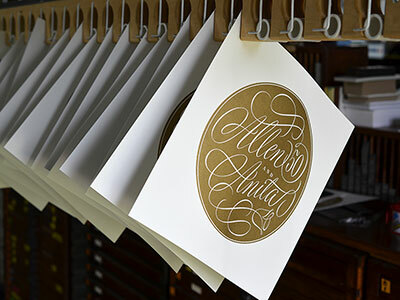 Considering the achievement, and the gravity of the event, an elegant piece of script lettering in the English round hand tradition seemed appropriate. However, not wanting the final artwork to appear too stuffy, I added a dash of levity inspired by loose early twentieth century American models for good measure. After exploring two or three rough thumbnails, a full-size comp was hand-lettered in tight pencil on a letter-sized sheet of 25 lb. tracing paper which would ultimately serve as a template for the final vectorized artwork. 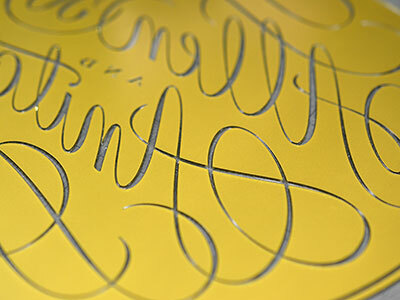 I wanted the final image to have a robustness that the delicate letterforms themselves might not be able to deliver. 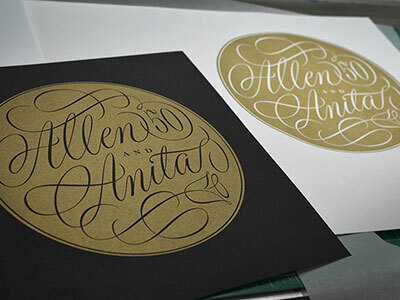 Still a novice with letterpress, I soon realized that knocking the lettering out of a solid shape was an approach probably better suited to serigraphy. 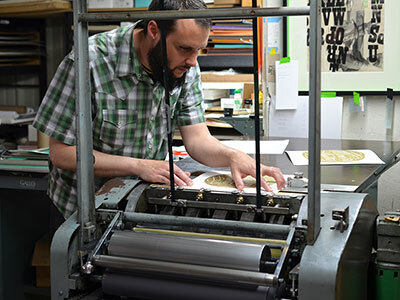 Nevertheless, after making more tweaks than I care to remember, the Vandercook Universal III was finally up to the task. And, in the course of an afternoon, I only managed to print on the press tympan twice! 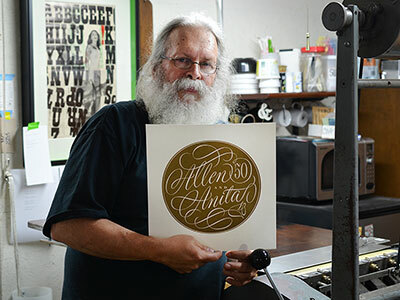 Ray Nichols of Delaware’s preeminent letterpress printing studio, Lead Graffiti, exhibited an admirable degree of generosity and patience as we worked through countless printing tactics, trial proofs and paper stocks. 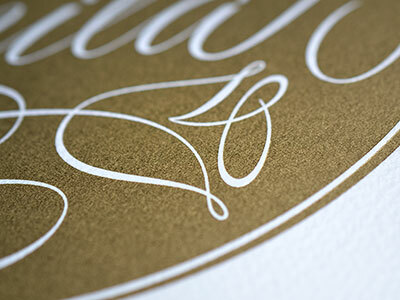 Before we knew it, the impossibly snappy gold metallic ink was laying down exquisitely on the bright white cotton sheet. Thanks for everything, Mom and Dad—happy anniversary!